3D Printers are revolutionizing manufacturing processes, providing technology solutions for rapid prototyping and additive manufacturing. Able to quickly realize digital designs into 3D models, this printing technology has a huge variety of industrial, commercial and even domestic applications. RS Components 3D printers offer is a wide choice of a variety of 3D technology printing solutions from leading brands, from larger heavy duty models for the factory floor to economic desktop printers for the office. Whatever you need to create, or problem you need to solve, we have versatile 3D printers and accessories to suit your creative ambition. 3D printers typically use rapidly setting heated filament to build a model layer by layer. Some printers can use 2 filaments at the same time creating mixed layers effect. There are various plastic and metal and metal-based filament materials available to suit the requirements of the 3D model. Printer sizes are available to interpret the dimensions of any CAD or AMI digital file. 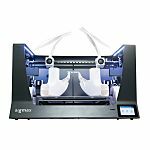 A range of build volumes and speeds are included to better suit your 3D printing operation, whether used sparingly for part replacement, or for high volume print-to-order demands. What is a typical application of a 3d printer? No more waiting for specialist parts! Manufacture custom parts or replicate replacement parts with a high-quality filament. Whether youre scanning original parts and tools for replication or producing according to a licensed manufacturers design, 3D Printing technology has revolutionized the supply chain. Take control of your design and build process, and take the delays out of essential maintenance. Practical model building is still preferred by many customers over digital modelling, and 3D printing allows you to make digital models a physical reality, quickly and easily. For showcasing a design or concept, utilize 3D printed constructs to translate your vision to a tangible customer presentation. 3D printing is also revolutionizing medical and scientific processes. From creating customized prosthetic parts to specialist apparatus, 3D printing presents a flexible and cost-effective solution for highly individualistic demands. In medicine, it is sometimes necessary to have apparatus and surgical tools printed to the specifications of an individual patient scenario, and the RS range of 3D printers can facilitate this effectively and efficiently. What 3d printer brands are the best on the market? There are many brands manufacturing desktop or large format 3d printers. High-end printing machines from RS PRO, Ultimaker, Zortrax, Makerbot, CEL, BQ, ZMORPH or BCN3D can meet requirements of most demanding customers and these brands are complete 3d printing technology producers. Their products are not only 3d printers but also filaments, software, and spare parts such as extruders or nozzles and any other 3d printing components.